The Moscow Region town has managed to preserve its medieval fortress, which survived attacks from Crimean Tatars, Mongols and Poles. The town of Zaraisk, located some 90 miles southeast of Moscow, is a standout among the many interesting towns in the Moscow Region. Although modest in size, it is associated with three extraordinary figures in Russian history: a heroic prince — Dmitry Pozharsky; a great writer — Fyodor Dostoevsky; and a major sculptor — Anna Golubkina. Zaraisk has another quite visible distinction: a uniquely preserved brick fortress, or kremlin. 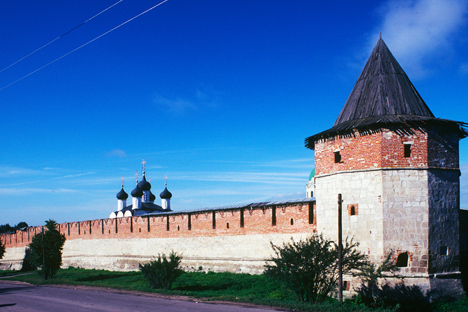 Although other regional towns such as Kolomna have restored fragments of larger fortresses, Zaraisk has managed to save a complete walled enclosure built in the 16th century whose stout walls witnessed dramatic events at critical points in Russian history. The first mention of Zaraisk in medieval sources occurs in 1146, one year before the earliest reference to Moscow. At that time it was called Osyotr, after the Osyotr River, a small tributary of the Oka. By the beginning of the 13th century the settlement was known as Krasny, a word that means “red,” but also meant “beautiful” in medieval Russia. But this fair reputation did not spare the future Zaraisk from the cataclysm that struck the Russian lands with the invasion of the Mongol armies of Batu Khan in the late 1230s. The fate of Krasny was closely linked to that of the thriving city of Ryazan, some 40 miles to the southeast. Reliable historical information is sparse for this period, and fact and legend are often intertwined. In early December 1237 the forces of Batu Khan approached Ryazan, which they stormed and devastated after defeating the forces of Prince Yury, the ruler of Ryazan. The prince was himself killed in the battle. This bare account was richly elaborated in a work called “The Tale of the Destruction of Ryazan,” attributed to a priest at the Church of St. Nicholas in Zaraisk. In this tale, Prince Yury sent his son Fyodor to negotiate with Batu Khan, but the Mongol leader had no reason to relent. To get to Zaraisk take a regular bus #330 from Moscow (Vykhino bus station). The trip takes 2.5 hours. Hearing of the beauty of Fyodor’s wife Eupraxia, Batu made offensive proposals that were firmly rejected by Fyodor. When Eupraxia learned of her husband’s death at the hands of the Mongols, she leapt from a tower with her infant son rather than submit to Mongol capture. By some accounts, her death occurred at the site subsequently occupied by the Church of St. Nicholas in Zaraisk. By the late 15th century, Muscovy had finally succeeded in freeing itself from subservience to the Golden Horde, but its southern lands were increasingly vulnerable to raids by Crimean Tatars. In response to the Crimean threat, Tsar Vasily III (1479-1533) strengthened the southern borders with a fortified line anchored by fortress towns. After Ryazan was absorbed into Muscovy, work began on a brick and limestone kremlin in the center of Zaraisk. Built between 1528 and 1531, the rectangular Zaraisk kremlin is a gem of Russian fortress architecture. Its imposing brick walls are reinforced by four corner towers as well as three gate towers — all originally without the peaked wooden caps added much later. The fortress repulsed several Crimean Tatar attacks, but Zaraisk was not left in peace. It played a significant role in the Time of Troubles, a conflict that was part civil war and part dynastic struggle involving Polish claimants that lasted over a decade. In 1608, Zaraisk was seized by Polish forces, and costly attempts by Russian patriots to retake the town succeeded only in June 1609. In 1610, command of the Zaraisk kremlin was given to Prince Dmitry Pozharsky (1578-1642) and in early 1611 he and his Zaraisk troops marched on Polish-occupied Moscow as part of the First People’s Army. Wounded in the struggle, Pozharsky withdrew to his estate until news came of a second People’s Army, led by Kuzma Minin. With Minin's proclamation of support, Pozharsky took command of the new army and in August 1612 expelled Polish forces from Moscow, thus clearing the way for the young Michael Romanov to assume power. With the country’s recovery, Zaraisk continued to serve as a fortress, repulsing its last raid from the Crimea in 1673. In 1681 the Cathedral of St. Nicholas was rebuilt in the kremlin and is now the town's oldest church. The fortress also contains the Cathedral of the Decapitation of John the Baptist, reconstructed to a design by Constantine Bykovsky in 1901-04. The modest growth of Zaraisk in the 18th and 19th centuries is reflected in surviving monuments such as the Church of the Annunciation and the Church of Elijah the Prophet, as well as merchant houses and a complex of neoclassical trading rows. During the early 19th century, Zaraisk became a local center for the grain trade, but major road development passed the town by. A monumental brick water tower, completed in 1914, testifies to economic growth just before World War I. In the history of 19th-century Russian culture, Zaraisk is best known for its association with the childhood of Fyodor Dostoevsky (1821-1881). In 1831, his father, Mikhail Andreevich Dostoevsky, purchased an estate at the nearby village of Darovoye. The road to Darovoye passed by the Zaraisk kremlin, and near the main kremlin gate tower there was a station from which coaches left for Moscow. Every summer Dostoevsky’s mother would walk with her children from Darovoye to Zaraisk to post letters to her husband, who was still at work in Moscow. Zaraisk has a street named after the great writer, and the remains of his mother, Maria, rest in a tomb within the Cathedral of John the Baptist in the Zaraisk kremlin. There is also an indirect reference to Zaraisk in Crime and Punishment. At the turn of the 20th century, Zaraisk nurtured another artist, Anna Golubkina (1864-1927), the first Russian woman to achieve major fame as a sculptor. Born in Zaraisk to a family of Orthodox dissenters known as Old Believers, Golubkina was largely educated at home. With the encouragement of a Zaraisk teacher, Golubkina left in 1889 for study in Moscow. Her studies subsequently took her to St. Petersburg and Paris, where she worked as an assistant to Auguste Rodin in 1897-1900. Returning to Moscow in 1901, Golubkina received several commissions, including the dramatic frieze “The Wave” over the main entrance to the Moscow Art Theater, designed by noted architect Fyodor Shekhtel. After the 1917 revolution, Golubkina continued to work as a sculptor and teacher in Moscow, but her health deteriorated. Seriously ill, she returned in the summer of 1927 to the family house in Zaraisk, where she spent her final days. In 1974 this early 19th-century house was converted to a museum that not only commemorates her work but also provides a view of a cozy pre-Soviet domestic setting. Today Zaraisk is a regional center confronted with the challenge of preserving its valuable architectural heritage in difficult economic conditions. Rich in associations with history and culture, Zaraisk forms an essential part of Russia’s’ cultural memory.